Josanna Lewin (Vital Voices - Business Women’s Network hub, the Eagle Women Empowerment Club (EWEC)). Born and raised in Hawaii, Josanna studied in Costa Rica for 6 months with the American Field Service (AFS) in 1998. She received her BA in Political Science from the University of Colorado at Boulder in 2004. Upon graduation, Josanna spent a year working as an English teacher at the Universidad Central de Ecuador in Quito, Ecuador, and in Italy. Josanna spent three years working in San Francisco in the business development field. She is fluent in Spanish and has worked as a Sexual Health Educator with the Marin Aids Project (MAP) for at risk Latino youth. At the time of her fellowship, Josanna was pursing her Master’s in Public Administration AT the Monterey Institute of International Studies (MIIS). After her fellowship, Josanna wrote: “It has been a summer of learning, sharing and laughing with some incredible women. They are beautiful women and it is these women, these mothers, these sisters, these leaders, who are the future of Africa. This was a truly incredible summer and I’ve had such a positive experience. 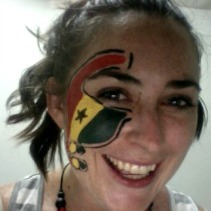 I’ve fallen in love with Ghana!" Do you know your Ghanaian name? I was surrounded by hundreds of sweaty men screaming, leaping, chanting, and going absolutely wild.